I showed a preview of this project in yesterday’s post, and judging from some of the comments, I think there are those among us who have minds in the gutters! The ears are a little antigravity, but it contributes to the puppy’s perpetually surprised expression. The other thing that mildly bugs me about this project – I’m lousy with embroidery and severely fudged burying the black thread ends. Something tells me I should have embroidered before assembly, oh well! Next time! It’s still pretty damn cute. 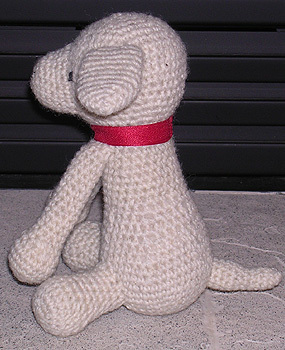 For the record, it’s crocheted with organic Shetland wool and stuffed with white Border Leicster fleece. The amigurmi book with the pattern is here. Matt and I are taking a little road trip to celebrate my birthday (today). See you in a few! Happy Birthday, June!! The puppy is adorable. Happy Birthday, June! Puppy needs some black spots and he’d be a perfect Scullery Dawg. Happy birthday. Puppy is great. Happy Birthday! May the upcoming year be a wonderful one for you. he is so cute! I can’t believe you are a new crocheter, that is a fantastic little animal. I love it. (him-her–whatever). And Happy Birthday! have a great time. Happy Birthday to you! Have a nice trip! Looks like my all white Jack Russell Terrorist,er, terrier, right down to the ears. I love it! So cute! A very merry unbirthday to you. Happy Birthday! A day late! And you have finally won me over. 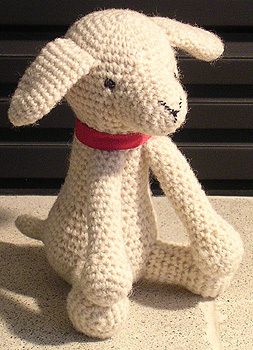 I’m willing to embrace crochet, if it can make things as cute as a perpetually surprised puppy. Have a great birthday!!! And super cute puppy! Awe, shoot, that is really cute and I’m sorry I had my mind in the gutter. Hope you have a great birthday! Happy birthday! It IS very cute and with just a little work, could probably be a sheep. Happy birthday! Didn’t guess a dog obviously. Happy Birthday, June! Have fun on your trip. The mitered cable is amazing. I know I must be capable of such art too, and someday when my children don’t require so much of my grey matter, I will attempt it myself. Bravo! Have a wonderful birthday! The puppy is so cute! Loved your mitered cable post too. Re short-rows & wrapping… I recently used short row shoulder shaping on a cardi back, and the textured pattern prevented me from working the wrapped turns in the usual way. I solved this by picking up the wrap, carrying it behind the stitch, and knitting it w/ the next (or previous stitch, depending on whether I was on the RS/WS). It turned out quite well. Maybe something like this might work? Oh wait, looked a bit closer at the details, answered my own question. 🙂 How I wish I read Japanese! aww… i like how the puppy (organic shetland!) is touching his toes. that mitered cable swatch below is beautiful.